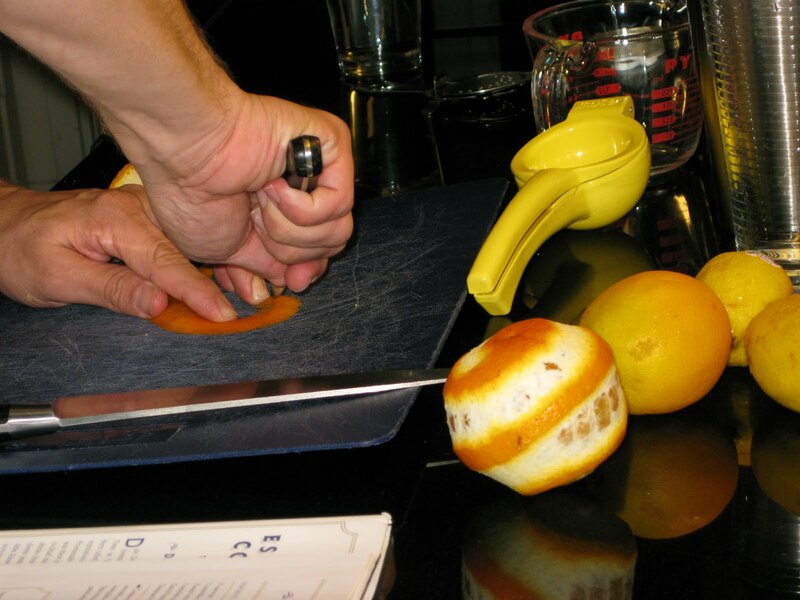 A lot of drinks call for orange peels, but they're not the easiest to do. Sure, it's easy to slide an orange and put it on the side of a glass, but actually carving an orange peel is hard. 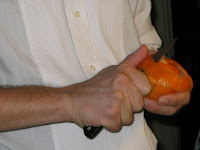 So here are a few recommendations: First, use a paring knife. Some people use a vegetable peeler, but I find that I have more control over a sharp paring knife. Notice that I said sharp. I mean it. If it ain't sharp, don't try to peel an orange. You'll just end up peeling your skin. Second, peel however it is comfortable to you. I peel toward myself, even though my wife grimaces whenever I do it. 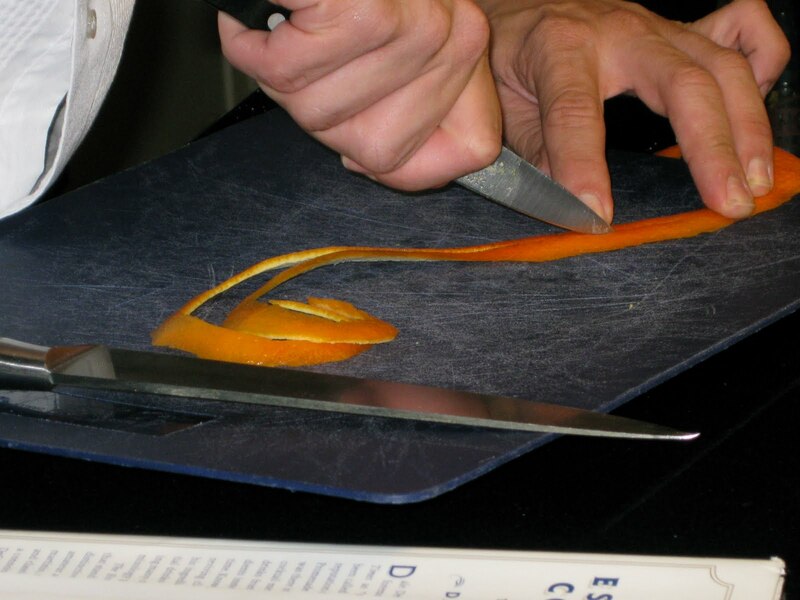 Sorry, but that's the only way I can peel something consistently, and as long as my knife is sharp, I haven't cut myself yet. Third, don't try to peel the whole thing. Leave a bit between each revolution, as you see here: Then you can actually go back and get another peel from the leftovers. Nice, huh? Fourth, I actually cut my first peel in half. I just take it, lay it on my cutting board, and cut it down the middle. If you want a peel that is more delicate, you could cut it in thirds, but that's harder. Basically, the point is that the first cut is too think and silly looking. This is cocktail hour, after all, so appearance matters. Hell, appearance is at least one third of a pleasing drink. Serve something in a plastic cup, and it doesn't matter what it is, it won't taste 2/3 as good as being served in the proper glass. As you can see here, I just take my time and cut the peel in half. Fifth, the peel should curl on both the outside and inside of the drink. Don't try to make it all dangle outside, or it looks silly, but don't make it all inside, or you can hardly see it. Do it right, and it looks nice. I'm still not an expert, by any means, but it's fun to try, and eventually I won't have any of that terrible pith underneath. 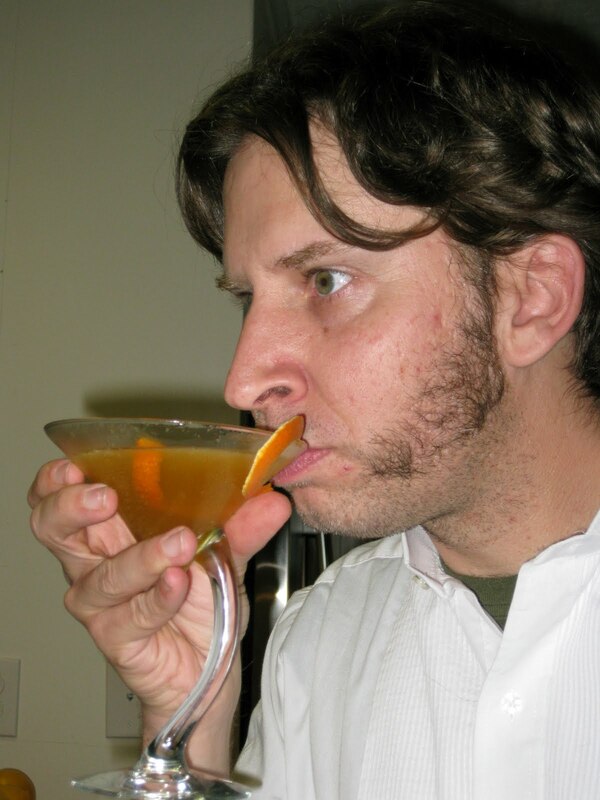 That's the nice thing about cocktail hour: it's there to enjoy, not to judge.